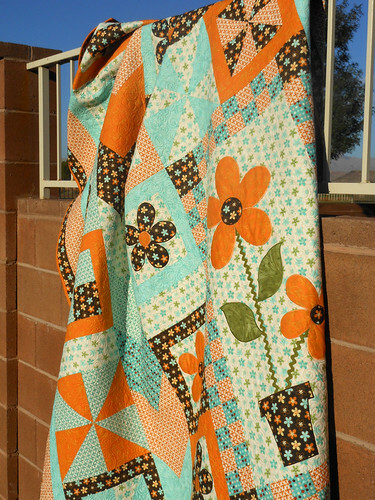 Green Fairy Quilts: I love flowers Double Feature!!! I love flowers Double Feature!!! Okay - if you know me, you know I love flowers! That's why a lot of my patterns have flowers in them. I am not afraid of applique because I machine applique everything. Sorry if that offends you needle turn applique people out there - I just don't have the patience for it myself. Satin stitch baby! That's how I role. See - applique can be fun and easy! Just let your sewing machine do it! I love the colors of this quilt. 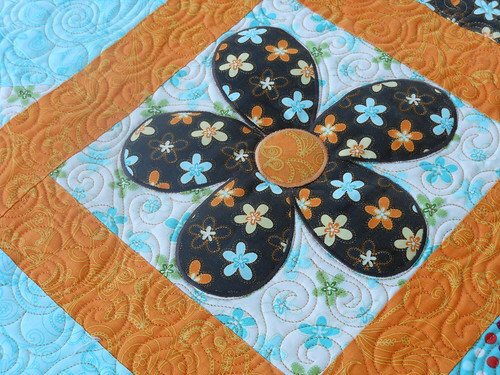 I quilted it with my allover flower swirl free motion quilting. This quilt is so happy! 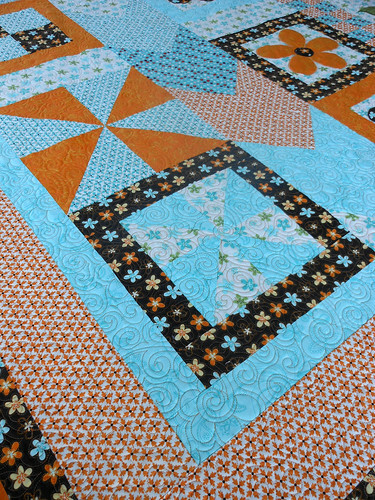 I love pulling out my quilts and getting good pictures of them because it makes me feel like I am getting some sewing done - which, I am not - but it helps me think I am! 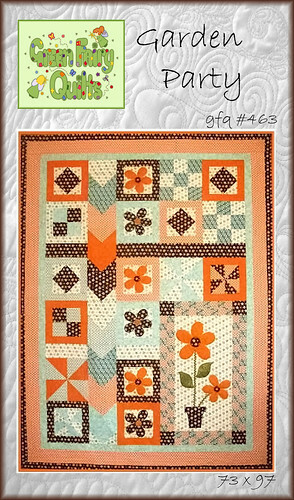 So, I give you "Garden Party" - at the top of my list of my patterns. It is really fun to make! You can get it on sale for $5.95 here for a limited time. Here's the double feature! This is by far my most favorite quilt! I made this pattern several years ago and it still is just right there at the top of the list. I wanted to feature this quilt not only because I love it, but because I wanted to show that you don't have to quilt just everything like I do. This was quilted way back when - and I would quilt more now - but it is the design that makes the quilt. 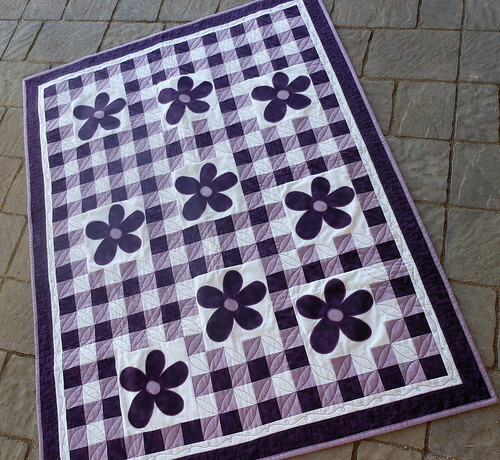 So, don't think that you have to quilt your quilts like this one just to make my patterns! I can't tell you how much I love this quilt! It is really simple to put together and you only need three colors. 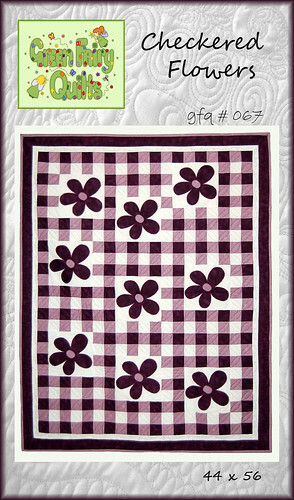 I can imagine it will work well with our new jelly roll Bella Solids - just get three colors and take out the cutting! I love that idea! So, I give you Checkered Flowers! My favorite quilt pattern that is so simple to put together. On sale now for $5.95 for a limited time, get yours here! Here's my Mama! She's made herself at home in our guest room because my dad has a job in town. She doesn't go anywhere without her traveling sewing machine and now my home is her traveling sewing machines permanent home. She's a little addicted to quilting and sewing - wonder where I got the bug? I love the quilts. 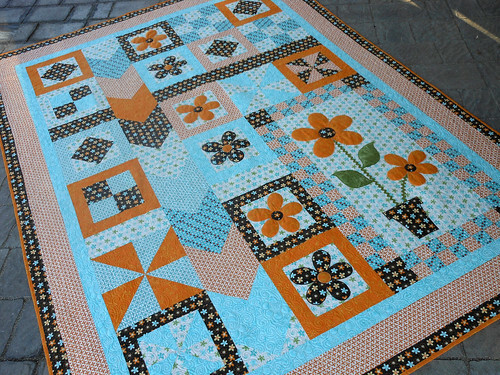 Your blog makes me want to drop everything and go quilt. How great that your Mom travels with her sewing maching. 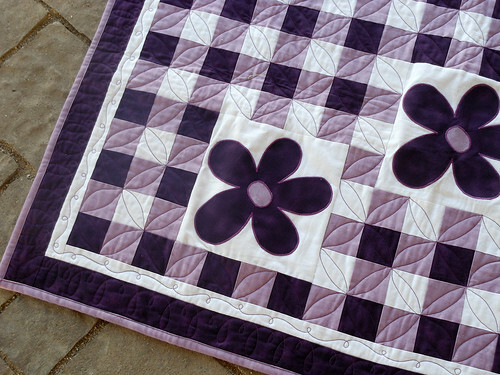 Beautiful design and of course your quilting is lovely.Lucky you to have a Mum to share the joy of quilting. I was lucky that my mum was into sewing and let me use her machine until she bought me my own at the age of 10. I, too, love flowers Judi. And enjoy all your flower patterns. Both these patterns are just adorable!! I love to do hand applique, I just think going slow works better for me and I am affraid that if I tried to power through on the machine I would kill it! LOL But yours looks beautiful! If it looks that good and works for you, well then by all means! You know! These are both beautiful patterns! I am thinkin fo doing something like the purple on but with pink ribbons for a benefit! Wow love all those quilts. I have so many projects started I hate to say. These will just have to go on a wish list. I love your mom, she certainly wedged herself in the corner. Do you let her out!!! Lucky you. Having something in common with your mom. Quilt shopping and quilt making together should be more fun. 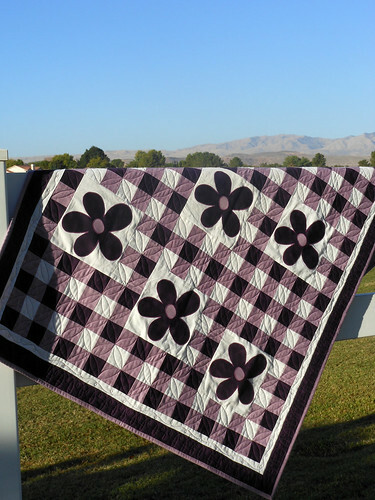 I love the checkered flowers quilt! How sweet that is! Hi Mom! 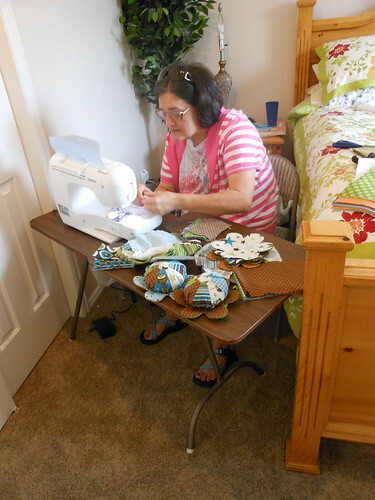 Love how she is trapped in there with her machine by the bed - no plans on going anywhere :) I'm trying to talk my Mom into taking up quilting. I think I am wearing her down.